‘Buy One Get One Free’, ‘2 For 1’, ‘Half Price’, ‘Special Offer’, ‘25% Off’……bargain hunting Brits are always searching for the very best deals; both on and offline. So, back in November 2014 Google released a new Google Shopping ad extension to satisfy its shopper’s demands and they have been revelling in the benefits ever since! But this was just the very beginning…. Since the switch over from Product Listing Ads (PLAs) to the new campaign update Google Shopping back in July 2014, Google has released four new and major shopping extensions that change the face of the Google Shopping real estate. These four changes are 1) Merchant Promotions 2) Google Price Drop 3) Local Inventory Ads 4) Product Ratings, and the most recent Google gossip is the ‘Buy Now’ button which is rumoured to be added to Google Shopping ads very soon. With the Google Shopping real-estate becoming more competitive than ever before, implementing shopping extensions should be an absolute must if you are striving to deliver the very best results for you and your clients. It used to be about ensuring maximum exposure of products to shoppers, but now there is a much greater focus on ensuring there is a competitive edge in the space. So how can you clinch that click over one of your rivals? Trust & incentives – that’s how! 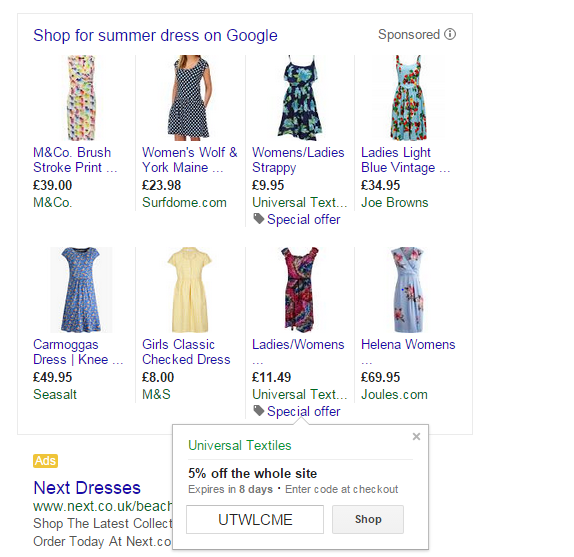 One of the most prevalent updates for Google Shopping was Merchant Promotions. Similar to standard text ads, merchant promotions give advertisers the opportunity to highlight a special offer alongside their ads in a mini pop up. The offer is revealed when a shopper clicks on the ‘Special Offer’ text below the ad. Enticing? Absolutely! 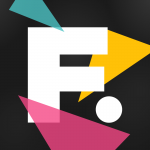 Incentivising shoppers with a promo code or ‘free delivery’ results in a more qualified click as users can see the offer associated with the product before clicking on the ad. With higher click through rates and increased conversion rates, it is no wonder this has been a fast adopted strategy by Google Shopping enthusiasts! So, how can you jump on the merchant promotion bandwagon? Well, there is no additional cost to implementing this extension, and set up is very simple too! All you need to do is fill out a Merchant Promotions Interest Form. Once your application has been successfully approved, you will see a ‘Promotions’ tab in the left hand side of your Google Merchant Centre (GMC). It is important to note that Merchant Promotions are only applicable in conjunction with a promo code – so unless you have a promo code, you cannot create a promotion in your GMC. Promotions, promotions, promotions. We are beginning to see more and more ‘price drop’ annotations showing in Google Shopping ads – and shoppers are loving them. At present, Google show these annotations automatically based on any merchant feed price changes over the previous 90 days. As this is automated, advertisers are beginning to dig deeper into ways of applying these price drops manually through their feed. But until Google releases this update, you will just have to keep your feed up to date and of high quality, and then sit tight as you watch your price drops show (…or not). This does exactly what it says on the tin – shows Google Shopping ads to shoppers planning their shopping trip locally. Again, going back to the qualification of clicks, users can better understand the availability of the products they are searching for in a nearby store before making a purchase or going to visit the store. The objective of this extension is to drive traffic to the site by showing local product availability. The focus of the extension is to act as an assistor in the purchase funnel and to add incremental value to the business offline. With the research phase becoming an even more crucial aspect of shoppers buying behaviour for on and offline purchases, Local Inventory Ads help to give users a much better understanding of pricing, quality and most importantly, availability in a local store. You may be concerned that Local Inventory Ads deter shoppers from purchasing products online – and therefore you are wasting the cost of a click for a user that is not converting online. Therefore it is crucial to mention here that having your local product catalogue on as many channels as possible is the best way to ensure maximum visibility – the perfect omni-channel shopping experience. If you provide shoppers with high quality data that they can trust, then they are much more likely to return to your store both on and offline; allowing you to capitalise on your returning visitors later on. Product Ratings was released July 2014 in the U.S and it wasn’t long after that it hit the U.K. Showing star ratings for individual products became an instant USP for retailers. But to ensure successful implementation of this most talked about extension involves encouraging customers to leave real and honest reviews about your products. Google will show your product reviews when you have signed up to a review aggregator or obtained reviews directly from Google. Unlike seller ratings which show in standard text ads – where they only show if you have received 30 or more reviews with a star rating of 3.5 or above, Product Ratings for Google Shopping can show no matter how many stars you have accumulated. So, if you have a history of poor product reviews then it would be advised to hold fire on integrating this extension into your campaign, otherwise it may have a detrimental effect on campaign performance. Successful implementation of these ratings will see the achievement of higher click through rates and higher conversion rates, as shoppers have a huge amount more trust in the products you are promoting. Again, implementation is simple. You have to fill out this form, a Google representative will then put you in touch with the right person to action your request*. *It is important to note that if you already use a third party aggregator, you may have to pay an additional cost to opt in for product ratings if this is not already part of your current programme. The last (but by no means the least) is the Google gossip which is spanning the net. This is the release of the ‘Buy Now’ button being added to mobile searches for Google Shopping…watch this space. So, whether you are looking to entice new customers towards your site with an exclusive promotion or want to increase customer visits to the store, Google Shopping’s ad extensions allow you to do all this and more. Just make sure you stay ahead of the game because advertisers are adopting these strategies as quick as they are being released. And no-one wants to get stuck at the back of the shopping queue.